Images of pregnant Black teenagers and single Black mothers are plentiful in the media and popular culture. These representations have fueled debates on the need for welfare reform and have focused public attention on adolescent pregnancy among Black Americans. 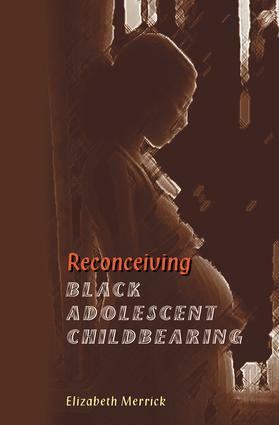 In Reconceiving Black Adolescent Pregnancy, Elizabeth Merrick presents a new understanding of childbearing and adolescent development among lower income Black American teenage girls. The author focuses primarily on the individual stories and themes of the six participants in the study. The first section provides the context, and the second section provides the major thematic findings. The final sections focus on agency and identity in this population. The findings that emerged from Merrick's study yield a provocative view that stands in marked contrast to assessments of pregnant Black adolescents as being deviant or greedy for welfare. There is a need for developmental models that start from, or at least incorporate, non-majority experiences. In particular, ethnographic accounts can provide key insights into different developmental pathways. Out of such accounts, new paradigms may also emerge to guide developmental research. Reconceiving Black Adolescent Pregnancy fills this void.